Push Notification - New Feature Added | Team OS : Your Only Destination To Custom OS !! 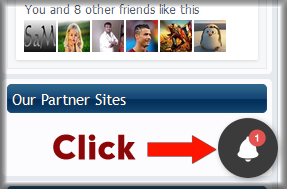 This feature will notify you a quick alret to get Notification from site & new updates. Push Notification which allow users to opt-in to timely updates from site & allow you to effectively re-engage them with customized, engaging content & see what you got recently. Wait for a while you will see a dialog box asking for Permission. Click On Allow Button And its Done. You Will Get Push Notifications From TeamOS. You can see numbering on ''Bell'' Icon means how many notification you have till now. So you may Click on ''Bell'' and you can see all of them in list so just click on any Notification and it will bring you there plus that Notification will be disappeared once you clicked. Hope you folks will enjoy this feature. Feedback! This site gets better every friggin" day! currently push-notifications are working on-site only , not of-site , so kindly give us few days to fix this issue , once fixed you will get of-site update too . But when I click the title in that panel, the link title disappears instead of taking me to the link. and the link will take you there to that thread. it will take you to the link , working fine at my end. It's working fine now at my end. I just have to wait a few seconds for the links to take me to those threads. Glad to know it works for you, but you can see i highly mentioned how it works and where you should click. wonderful work strength thanks alot. The most useful and updated site on the internet. Proud of TeamOS-HKRG. Kudos to the team.